Filip Biljecki awarded the "Young Researcher Award in GIScience"
The Austrian Academy of Sciences' (ÖAW) Commission for GIScience has awarded the “Young Researcher Award in GIScience” to Filip Biljecki, a PhD student at Delft University of Technology, for his outstanding publication achievements in the field of Geographic Information Science and Geoinformatics. Filip specializes in his research on 3D GIS and city models. In his colloquium talk, Filip introduced current projects of his research group and gave a brief overview of his PhD thesis. He focuses on the level of detail and error propagation in 3D GIS. The research investigates how errors in the reconstruction of 3D building models affect the output of spatial analyses. An approach involving intentionally degraded procedural models was developed, and this technique was applied to estimating the solar irradiation on rooftops. Although Filip has a deep technical background in 3D data models and representation, some scientists from different research domains of the Department of Geoinformatics - Z_GIS identified common research interests, which may lead to future research collaborations. 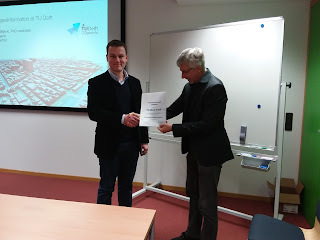 It was an honor for the Department of Geoinformatics to hand over the award on behalf of the ÖAW to Filip. Global GIS Day every year is a wonderful opportunity to invite schools to get in touch with Geoinformatics, experiencing how to bridge the real and virtual worlds. More than 200 pupils from several schools in and around Salzburg visited Z_GIS on Nov 16, working their way through 7 different modules ranging from operating robots to learning about drone aerial photography and managing a safe trip to school by bike. 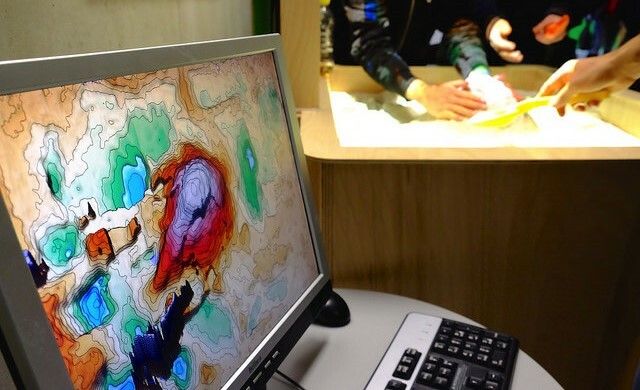 This year's GIS Day was an even more special event due to the opening of our new iDEAS:lab, where schools in the future will have year-round opportunities to learn about spatial technologies and related applications. In addition to functioning as a 'learning lab', this facility simultaneously will serve as a 'research lab', an 'open science lab' a 'transfer lab' in collaboration with our industry partners. The FWF project MORPH (Mapping, monitoring and modelling the spatio-temporal dynamics of land surface morphology) started at the beginning of November 2016. The project team seeks to develop novel methods for mapping, monitoring and modelling spatial-temporal dynamics of surface morphology including the analysis of various optical and radar remote sensing data. MORPH focuses on the investigation of landslides and volcanic deposits in two study areas in Iceland, which are highly dynamic in their geomorphic evolution and characterized by progressive mass displacements and surface deformation. One major objective is the development of an efficient object-based image analysis (OBIA) method for the multi-scale mapping of slope instabilities and volcanic deposits. The method aims to be transferable across various sensing data and at the same time automated in order to be able to analyse time series for monitoring spatio-temporal changes of land surface morphology. The MORPH project benefits from a close collaboration with researchers from the University of Iceland. 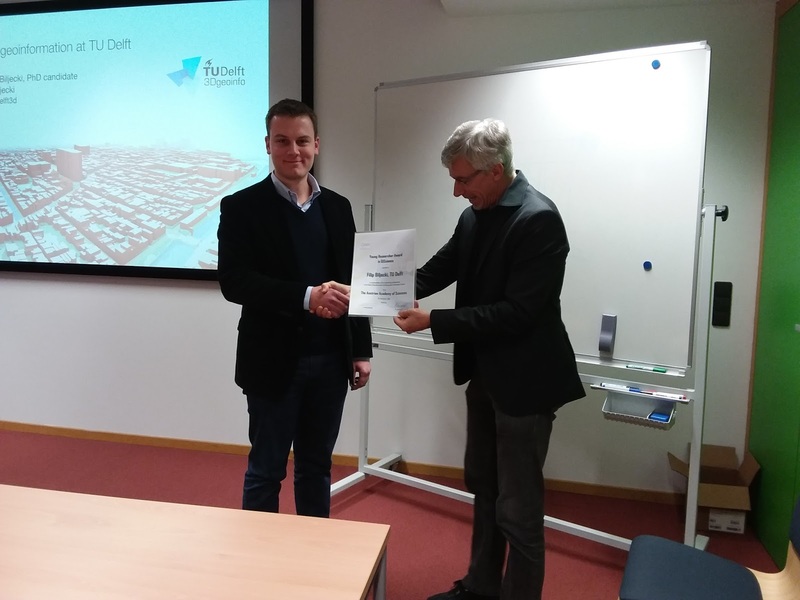 Daniel Hölbling (Z_GIS) was invited to attend the mid-term workshop of the EMMIRS (Environmental Mapping and Monitoring of Iceland by Remote Sensing) project beginning of November in Iceland. The workshop was an ideal opportunity to share experiences and become familiar with the characteristics and the evolution of the Hekla study site. Z_GIS is looking to fill a temp position (50%) at the senior lecturer level, please check the job advert at the official university gazette for details. Application deadline is Dec 7! addendum: we have been informed that this position is intended to be filled at a lower level than originally announced, please refer to a later edition of the gazette for a corrected version. 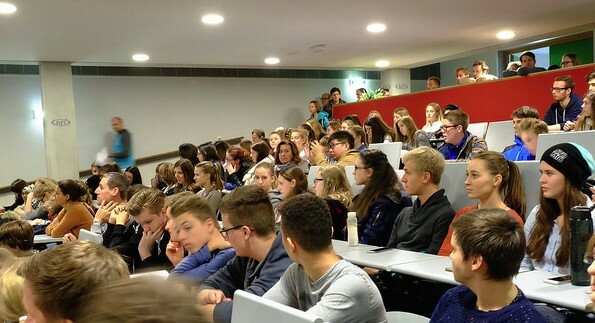 About 200 visitors: pupils, representatives from the local and regional governments, from industry and University of Salzburg leadership attended today´s opening of the iDEAS:lab - the main highlight of this year´s global GIS Day in Salzburg. The iDEAS:lab ("Integrated Digital Earth Applications and Science Lab"), located at the Techno-Z in Salzburg-Itzling, is a platform for education, research and cooperation with industry and the public. It serves as a multi-purpose open geospatial technologies and media lab, where visitors can experience, explore and understand Digital Earth technologies. The lab is open to schools, students, researchers and the public. Additionally, it is designed as an industry hub for networking and hosting business events. The aim of the new iDEAS:lab is to provide an engaging, dynamic and innovation-friendly learning environment for geoinformation science. In the iDEAS:lab, visitors use geo-technologies to explore solutions for their own lives, such as the safest route to school. 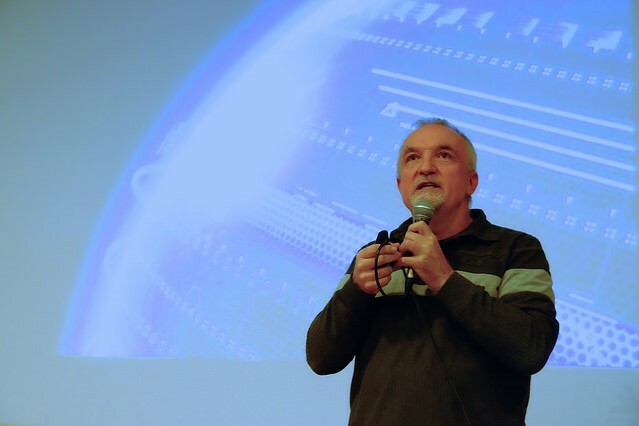 In addition, the iDEAS:lab will evolve into an interface between geoinformation science and the public, while at the same time serving as a transfer lab for industry. Recently the iDEAS:lab concept was nominated as a finalist for the Education Award of the B&C Private Foundation. 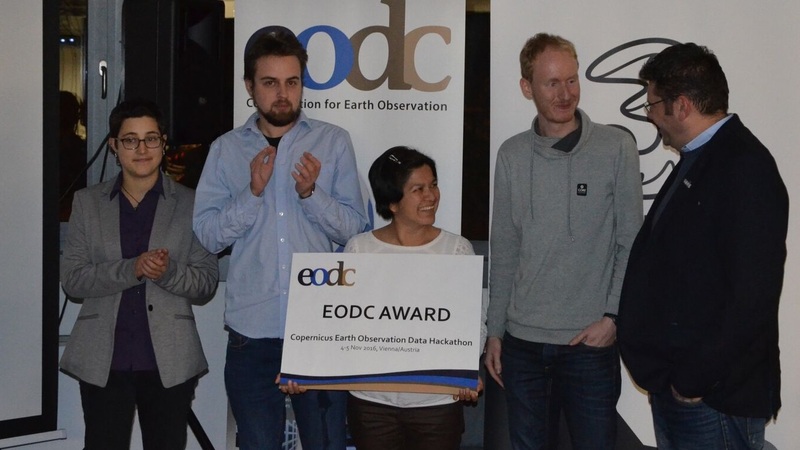 Martin Sudmanns, Hannah Augustin, Christian Werner, Stefan Zimmer and Gina Schwendemann are the winners of the first Open Data Copernicus Hackathon. At the two-day event, which took place in Vienna at the beginning of November, the Z_GIS team designed the "sharecropper app" and developed it as a prototype. The sharecropper app maps land cover changes detected using Copernicus Sentinel-2 images based on known farmland parcels. These changes are combined with crowd-sourced and open data related to land ownership and land use, creating a global inventory about the type and magnitude of changes. At the Hackathon nine international project teams - scientists, developers and data experts - designed applications in the fields of humanitarian action and human security. 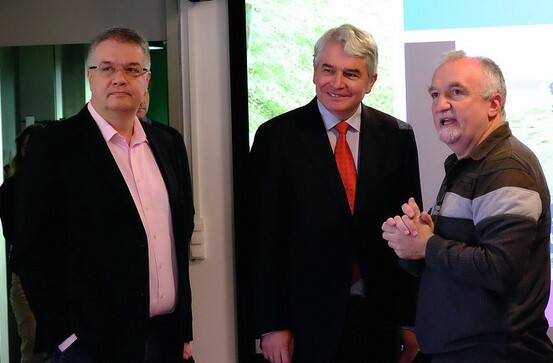 The Z_GIS team is one of two winners of the event, which was organized by the business incubator INiTS and financially supported by the Austrian Ministry for Transport, Innovation and Technology (bmvit) and the Austrian Research Promotion Agency (FFG). Z_GIS has been developing Earth-observation (EO) based solutions for the humanitarian sector for several years. On 7 November 2016 a Mapathon, jointly organized by Doctors without Borders (MSF) and the Austrian Red Cross, took place in Vienna. Staff and students from the University of Salzburg/Z_GIS participated together with 25 volunteers to support the Missing Maps project through their mapping in HOT OSM (Humanitarian Open Street Map). During the 3-hour Mapathon two areas where information is crucial for the work of humanitarian organizations were tackled: in Mwenezi district, Zimbabwe settlements and their main connecting roads were digitized to support the distribution of vaccination and medication supplies of MSF; in Malawi single household-buildings were mapped to strengthen the local Red Cross in their planning and capacity building activities related to disaster response. Z_GIS participated in the conference “Satellite Applications for the Alps” which took place in Berchtesgaden on 27th October 2016 and was organized by EURISY and WFG Berchtesgadener Land. The conference is part of a biannual series and dealt with different applications derived from or based on satellite communication and data with a special focus on the Alps. Participants from all over Europe (Norway, Denmark, France, Germany, Austria, Italy, Slovenia and more) attended the conference and fostered the interactive exchange between providers, users and experts. Florian Albrecht acted as expert for environmental monitoring for landslide detection and protection and represented the Land@Slide project currently being carried out at Z_GIS. Sebastian d’Oleire-Oltmanns took over as a moderator to lead a session on Connectivity, Tourist activities, Natural habitats and biodiversity monitoring and preservation. The conference provided a good opportunity to foster Z_GIS’ long term engagement and support of the Copernicus program as well as its user uptake initiatives.